MySQL Pronounced "my ess cue el" (each letter separately) and not "my SEE kwill." MySQL is an open source RDBMS that relies on SQL for processing the data in the database. MySQLprovides APIs for the languages C, C++, Eiffel, Java, Perl, PHP and Python. In addition, OLE DB and ODBC providers exist for MySQL data connection in the Microsoft environment. A MySQL .NET Native Provider is also available, which allows native MySQL to .NET access without the need for OLE DB. has become a popular alternative to proprietary database systems because of its speed and reliability. MySQL can run on UNIX, Windows and Mac OS. However, some time you need to provide remote access to database server from home or a web server. This post will explain how to setup a user account and access mysql server remotely. If you cannot locate “bind-address” in my.conf, you can add the following. connection this line should be removed from my.cnf or put it in comment state. 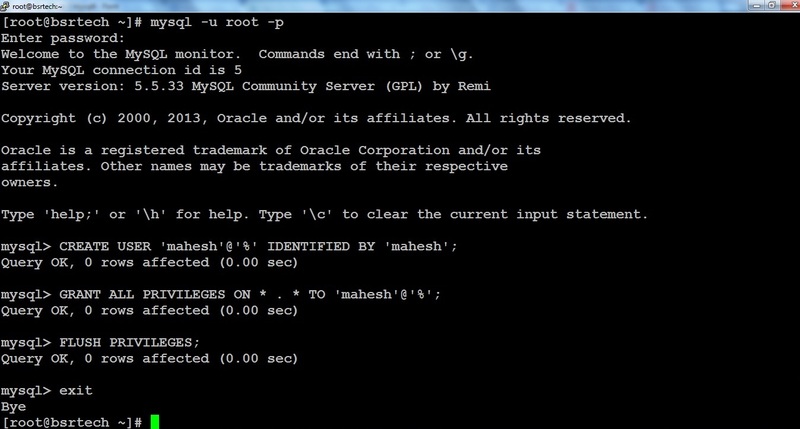 Step4: Grant remote access to the MySQL user(mahesh) within MySQL server as below. In the above command, I allow the MySQL user “mahesh” to access all MySQL databases from any remote host. In the above Post , I allow the MySQL user “mahesh” to access all MySQL databases from any remote host. how do config redirect with iptables?